Australian public transport’s first real-time information service, tramTRACKER, has just been revamped for android application, and free to download as an app from Google Play and Yarra Trams. The tracker has come a long way since it was launched by Yarra Trams in 2006, according to Yarra Trams Marketing Manager Matt McDonell. "We’ve built on the massive popularity of tramTRACKER for iPhone to develop an exciting new version which caters to the growing community of android users," McDonell says. "With more than half a million Melburnians using trams every day, we want to enhance the customer experience with even greater access to real-time tram arrival information," he says. Developing the new version of tramTRACKER has not simply been a case of transporting the iPhone app across to Android. Yarra Trams IT Business Analyst Prashanth Mullapudi says the tramTRACKER android is the result of extensive customer research, prototyping and field trials. "It’s an app built by passengers for passengers," Mullapudi says. "We collected feedback from our customers and comments in online forums about what people like and don’t like about the iPhone version. "We did customer research and testing to bring a new design and added features to the Android version of tramTRACKER." Initially released as a phone and SMS service, tramTRACKER rapidly evolved into a free online service and in June 2009 it found a new market as an iPhone app. Currently the popular tramTRACKER iPhone app is downloaded 20,000 times a month and the number of requests to tramTRACKER exceeds 800,000 a day. 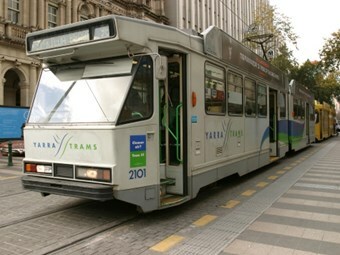 The android version of tramTRACKER is a free app available to download from yarratrams.com.au.
? Filters to show only certain routes at shared stops and/or low floor trams only. Icons to show which trams are air-conditioned or low floor.
? Graphics optimised to popular device screen sizes, resolutions and form factors, so the application scales to work on most tablets.
? Webservices use JSON instead of SOAP to ensure that less data is sent to and from the phone making tramTRACKER economical for both the user and Yarra Trams.
? Powered by mirrored databases and two IIS Servers that are load balanced and situated at two different Melbourne-based data centres.
? Enhancements to provide additional information such as "next three arrival time" information for a route with no additional server load.
? Due to CBD 'canyoning' interference, tramTRACKER does not utilise GPS, but rather draws predicted arrival times by calculating the distance of a particular tram from the stop the passenger is requesting. Trackside monitors transmit the tram’s speed, direction of travel and the distance the tram has travelled from the terminus. This information is compared to the tram’s schedule, as well as the time of day and other variables to make the prediction when the requesting device sends a four digit tramTRACKER ID.
? For increased accuracy of tracking, the myTRAM functionality of tramTRACKER android uses the phone’s GPS to track the progress of the tram on the route. Yarra Trams worked with Melbourne-based company Appscore to develop the android app.